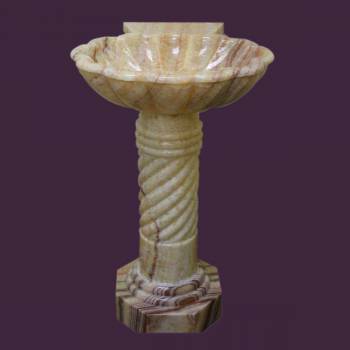 A sacred pool carved from the living earth--Designer Pedestal Sink for your bathroom! Let this stately stone sink be your ode to the ages, the centerpiece to a uniquely elegant bathroom. 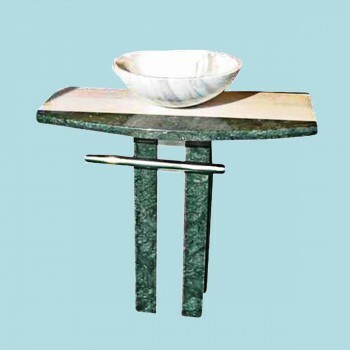 Hand carved and polished by artisans trained in techniques handed down through generations, this granite Designer Pedestal Sink will be custom bored to facilitate your choice of single hole, 4 inch centerset, or 8 inch widespread faucet. Due to the unique nature of natural stone, the veining may vary slightly from the image shown. Measures 34"h x 22"w x 21" proj. 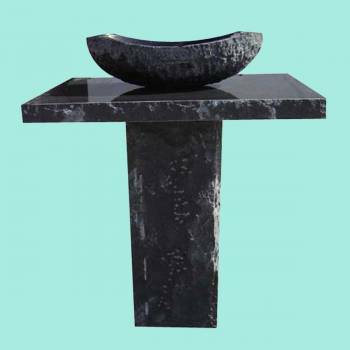 Luxury Pedestal Sink: A sacred pool carved from the living earth--for your bathroom! Let this stately stone sink be your ode to the ages, the centerpiece to a uniquely elegant bathroom. 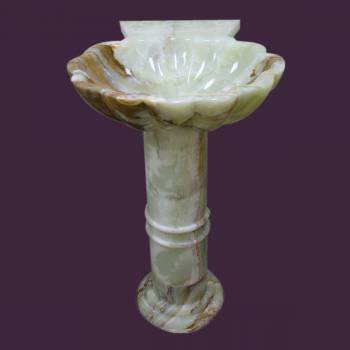 Hand carved and polished by artisans trained in techniques handed down through generations, this luxury pedestal sink will be custom bored to facilitate your choice of single hole, 4 inch centerset, or 8 inch widespread faucet. 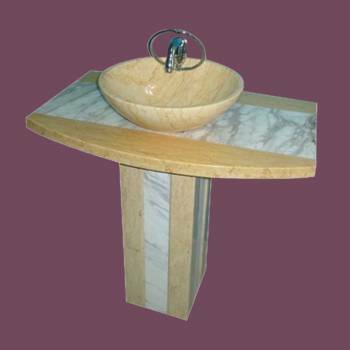 Due to the unique nature of natural stone, the veining may vary slightly from the image shown. Measures 34 in. H x 17 in. W x 17 in. proj. A sacred pool carved from the living earth--for your bathroom! Let this stately stone sink be your ode to the ages, the centerpiece to a uniquely elegant bathroom. 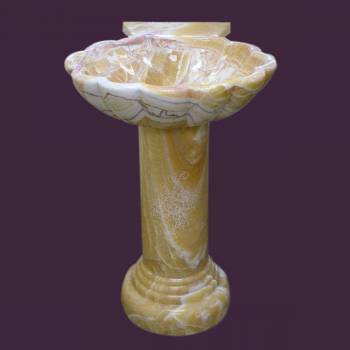 Hand carved and polished by artisans trained in techniques handed down through generations, this onyx pedestal sink will be custom bored to facilitate your choice of single hole, 4 inch centerset, or 8 inch widespread faucet. Due to the unique nature of natural stone, the veining may vary slightly from the image shown. Measures 36 in. H x 22 in. W x 21 1/4 in. proj. A sacred pool carved from the living earth--for your bathroom! Let this stately stone sink be your ode to the ages, the centerpiece to a uniquely elegant bathroom. 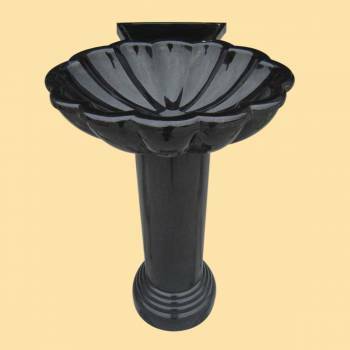 Hand carved and polished by artisans trained in techniques handed down through generations, this Onyx pedestal sink will be custom bored to facilitate your choice of single hole, 4 inch centerset, or 8 inch widespread faucet. Due to the unique nature of natural stone, the veining may vary slightly from the image shown. Measures 34 in. H x 22 in. W x 21 1/4 in. proj. 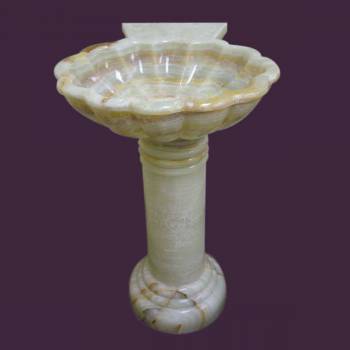 A sacred pool carved from the living earth--Fancy pedestal sink for your bathroom! Let this stately stone sink be your ode to the ages, the centerpiece to a uniquely elegant bathroom. 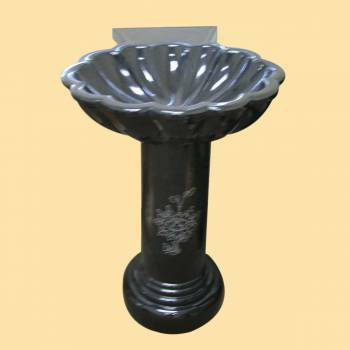 Hand carved and polished by artisans trained in techniques handed down through generations, this Fancy pedestal sink will be custom bored to facilitate your choice of single hole, 4 inch centerset, or 8 inch widespread faucet. Due to the unique nature of natural stone, the veining may vary slightly from the image shown. Measures 34 in. H x 22 in. W x 21 1/4 in. proj. A sacred pool carved from the living earth--for your bathroom! Let this stately stone sink be your ode to the ages, the centerpiece to a uniquely elegant bathroom. 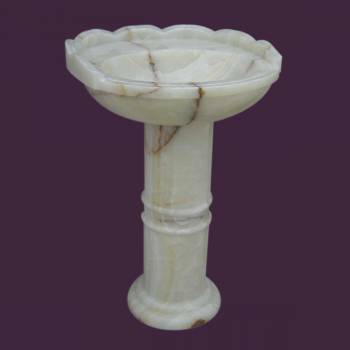 Hand carved and polished by artisans trained in techniques handed down through generations, this Onyx pedestal sink will be custom bored to facilitate your choice of single hole, 4 inch centerset, or 8 inch widespread faucet. Due to the unique nature of natural stone, the veining may vary slightly from the image shown. Measures 36 in. H x 22 in. W x 22 in. proj. A sacred pool carved from the living earth--for your bathroom! Let this stately stone sink be your ode to the ages, the centerpiece to a uniquely elegant bathroom. 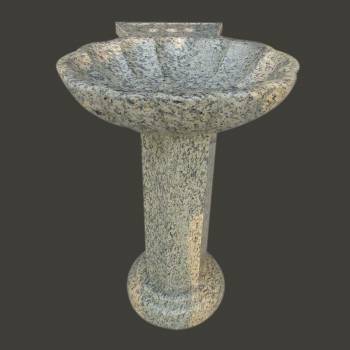 Hand carved and polished by artisans trained in techniques handed down through generations, this Granite pedestal sink will be custom bored to facilitate your choice of single hole, 4 inch centerset, or 8 inch widespread faucet. Due to the unique nature of natural stone, the veining may vary slightly from the image shown. Measures 34"h x 22"w x 21" proj. A sacred pool carved from the living earth--for your bathroom! Let this stately stone sink be your ode to the ages, the centerpiece to a uniquely elegant bathroom. 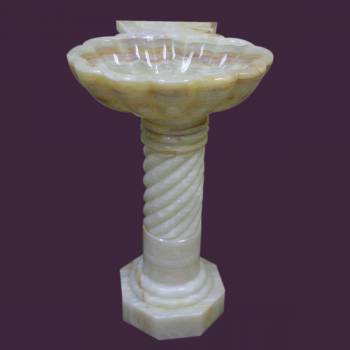 Hand carved and polished by artisans trained in techniques handed down through generations, this Onyx pedestal sink will be custom bored to facilitate your choice of single hole, 4 inch centerset, or 8 inch widespread faucet. Due to the unique nature of natural stone, the veining may vary slightly from the image shown. Measures 36"h x 22"w x 21" proj. A sacred pool carved from the living earth--for your bathroom! Let this stately stone sink be your ode to the ages, the centerpiece to a uniquely elegant bathroom. 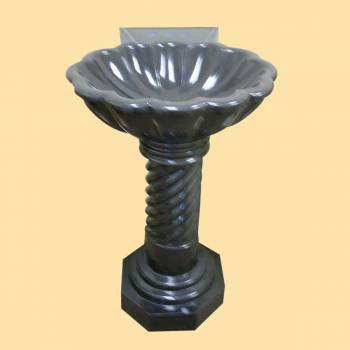 Hand carved and polished by artisans trained in techniques handed down through generations, this Granite pedestal sink will be custom bored to facilitate your choice of single hole, 4 inch centerset, or 8 inch widespread faucet. Due to the unique nature of natural stone, the veining may vary slightly from the image shown. Measures 34 in. H x 20 1/2 in. W x 13 in. proj. 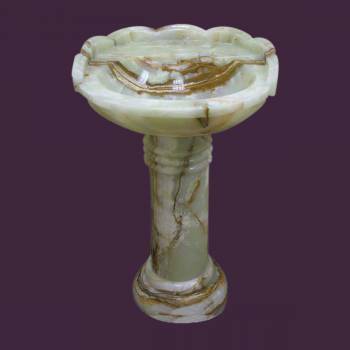 A sacred pool carved from the living earth-- colored pedestal sink for your bathroom! Let this stately stone sink be your ode to the ages, the centerpiece to a uniquely elegant bathroom. 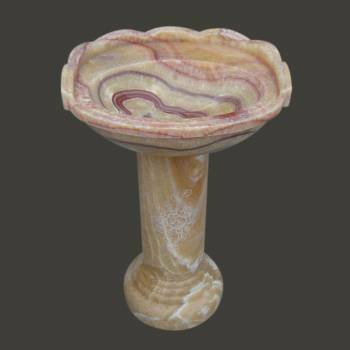 Hand carved and polished by artisans trained in techniques handed down through generations, this colored pedestal sink will be custom bored to facilitate your choice of single hole, 4 inch centerset, or 8 inch widespread faucet. Due to the unique nature of natural stone, the veining may vary slightly from the image shown. Measures 34 in. H x 17 in. W x 17 in. proj.